The GYMBOXTM is an innovative portable gym that is helpful for children with balance challenges and poor motor control. 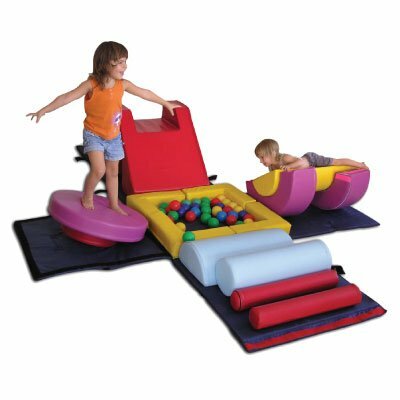 Extremely portable and compact for easy storage, this 39-inch cube easily unpacks into padded mats with seesaws, stairs, a ball pit (balls sold separately), slope for climbing up and sliding down, balancing plane, crawling tunnel and multi-size cylinders. The GYMBOX pieces connect to each other with Velcro, providing unlimited combinations for exercise, exploration and fun. Ideal for the home, classroom or clinic, it's a complete indoor therapy gym and playground in a box! With adult supervision, the GYMBOX can be used effectively for babies and toddlers, to enhance motor skills and develop imagination. For older children, modular pieces can be combined to create obstacle courses and group activities, encouraging them to work or play together and enhancing social skills and creativity. Adults can even use the GYMBOX for effective stretching! Note: This 39-inch GYMBOX is designed for children ages 3-8. There is a smaller 32-inch GYMBOX that is made for ages 0-3. With both models, there should be adult supervision with very young children. For Kids and Adults! - Combines development of muscles and motor skills with fun for children of all abilities; can also be used by adults for stretching. If you have any questions about this product by Fun and Function, contact us by completing and submitting the form below. If you are looking for a specif part number, please include it with your message.